Located opposite Buckingham Palace Mews, 41 is an intimate five star hideaway in a great location for visiting Buckingham Palace. For eating out, head to the hotel's Bbar restaurant and bar on the ground floor of 41 for cocktails, over 100 fine wines and modern bistro food. Luxury accommodation directly opposite The Royal Mews and Queen's Gallery, Buckingham Palace. 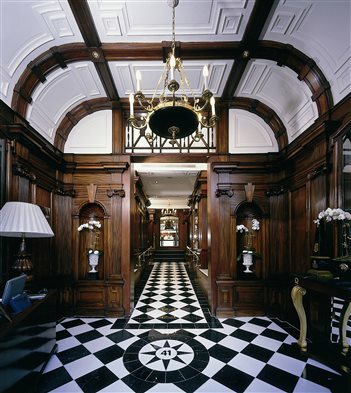 Named Hotel of the Year 2013 at the Catey Awards, 41 Hotel London owned by Red Carnation Hotels who specialise in upper-end hotels, is so close to Buckingham Palace you can almost hear the corgis yapping. Black and white decor extends from the entrance hall to all rooms and suites and traditional mahogany furnishings are matched to elegant contemporary design in the rooms while an army of efficient staff ensure that everything is polished and running smoothly. A genuine destination hotel. Bbar restaurant and bar is located opposite Buckingham Palace Royal Mews. Bbar restaurant and bar is located on the ground floor of 41 opposite Buckingham Palace Royal Mews, and minutes away from Victoria station and its surrounding theatres. The distinctly South African-influenced Bbar offers intimate surroundings making it a popular location to enjoy cocktails, more than 100 fine wines and modern bistro food with a South African twist. A downstairs bar, with leather sofas and warm lighting, is available for private hire and can accommodate parties of up to 60 guests. It is available for office parties, anniversaries and family occasions. The entire venue is also available for hire at the weekend, accommodating parties of up to 150 people. This private bar echoes the famous Leopard Room Bar at sibling Hotel d'Angleterre in Geneva. A private bar for discerning guests at the five star 41 hotel and adjoining sister property The Rubens at the Palace, the Leopard Champagne & Cocktail Bar has an intimate atmosphere designed in elegant safari chic, echoing the famous Leopard Room Bar at sibling Hotel d'Angleterre in Geneva. This haven of style where the finest Champagnes are on offer is perfect for celebrations or conversations in a warm, inviting and exclusive environment. Alongside a selection of light meals and smoked salmon sandwiches served throughout the day are whiskies, cognacs, armagnacs and cigars. For residents who really want to add some sparkle to that special occasion, the Dom Perignon Afternoon Tea is served on weekday afternoons from 2pm to 5pm Monday to Friday. From cheap budget accommodation to luxury 5 star hotels see our deals for hotels, including Thistle Trafalgar Square, The Royal Trafalgar from 47% off.